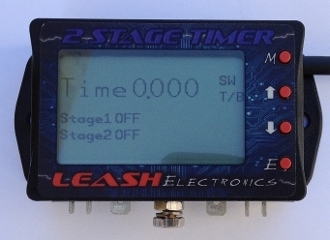 Heavy duty 2 Stage timer. Designed mainly for the use on 2 stage nitrous systems or bank activation on foggers systems. But unit can be used for many other time based activations like throttle stops, ect.. Unit features 2 internal 70amp heavy duty relays and J-case heavy duty fuses. Has an activation 12volt input that would normally be connected to a throttle switch. Also has a transbrake input that prevents activation while on transbrake and zero's time when transbrake button is pressed. Unit is very easy to wire and program. Can be set to turn relays on and off from 0-9.999 seconds in .001 increments or 0-99.99 seconds in .01 increments selectable below. If using for nitrous and would like the option to manually bump the stages you can click on options and add the bump relay module that will allow you to manually bump the stages on for $40.